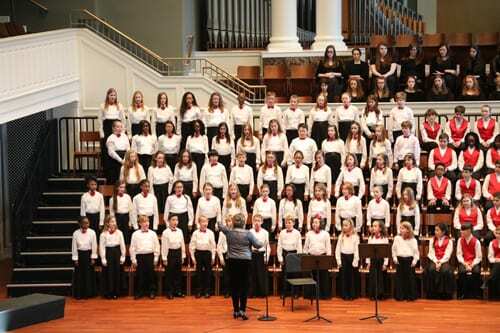 The CONCERT CHOIR includes choristers who exhibit ability and willingness to sing and who need additional singing experience and vocal training to become part of the more advanced Touring Choir. Children at this level have demonstrated a beginning ability to sing in parts. Note reading and basic score reading are stressed. The Concert Choir performs at the December and Spring concerts both separately and jointly with the other NCC choirs, as well as takes a one-day mini tour of area elementary schools each spring. Learn more about auditioning for the Concert Choir.